The U.S. Forest Service and Arizona Game and Fish are assisting the NCSO and Arizona Livestock in the investigation. 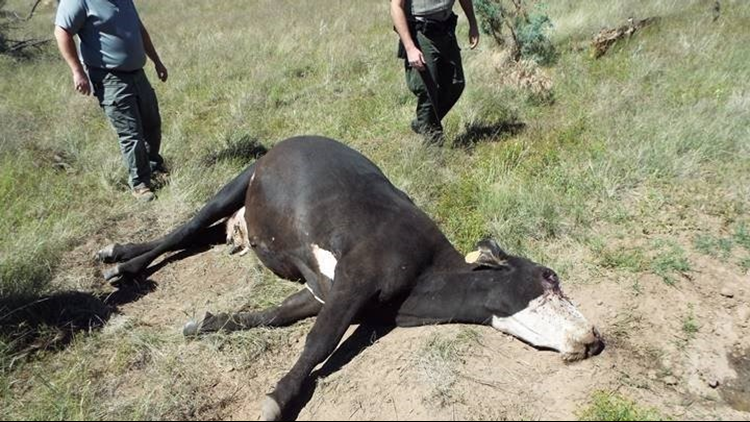 NAVAJO COUNTY, Ariz. - In the past five days, 24 cows have been found dead and reported to police in the Heber and Overgaard areas of Navajo County. It was initially believed the cows were shot and killed. On Sept. 9, a rancher in Heber reported to the Navajo County Sheriff's Office that he found two dead cows in the area of Forest Road 9886T west of Heber/Overgaard. Two days later, the NCSO were called about 14 more cattle found dead in the same area. A day later, the State Veterinary's Office helped evaluate and process evidence for lab tests. It was found that the cattle have all suffered from a naturally occurring ecological poisoning due to the current conditions in the forest. Toxicology reports are still processing from the state lab. Other ranchers have reported dead cattle as well, bringing the number to 24 as of Thursday afternoon. NCSO's criminal investigations unit and Arizona Livestock are investigating. The U.S. Forest Service and Arizona Game and Fish are also assisting in the investigation.